Put simply, entanglement means two things are forever connected no matter the distance between them once they interact. Physicists, of course, explain it with different words and the concept is considerably more complicated than this definition. 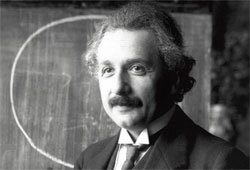 In 1935 Albert Einstein, Boris Podolsky and Nathan Rosen said, “According to the quantum theory, two spatially separated physical systems that had interacted in the past could be so strongly corelated that it would be possible to predict the result of measuring one or the other of two ‘complementary’ properties of the first system from a prior measurement of one or the other of two corresponding properties of the second system”. In The Age of Entanglement, When Quantum Physics was Reborn, science writer Louisa Gilder unravels the history of this complex formulation. The theory, which turned quantum physics on its head and drove scientists like Einstein to distraction, did not spring from the mind of a single scientist but evolved through time and through the give and take of many experiments. Gilder shows how from 1925 to 1927, Niels Bohr, Erwin Schrödinger and Max Born turned the theory into a tool that could be used to calculate how copper conducted electricity, how nuclei fissioned, and how transistors worked. Quantum mechanics was easy to use, but hard to understand. For example, two particles that interacted might subsequently fly to opposite sides of the solar system, and still act as if they were dependent. Measuring one near Pluto affected measurements as the other zipped by Mercury. Einstein viewed this inseparability as the fatal mark of the incompleteness of quantum mechanics: he sought a successor theory that would be local, realistic and therefore complete. That led to his 1935 letter—along with Podolsky and Rosen—defining entanglement. Gilder marshals an overwhelming collection of sources, but she fashions them into a narrative that even the average reader will be able to follow; scientists, too, should be able to appreciate this unique approach to history. The book characters teem with life. The one who gets the most sympathy is David Bohm, a student of J Robert Oppenheimer who dissented from political orthodoxy and paid for it with his career. Hauled before the House Un-American Activities Committee in 1949, he refused their bullying questions, lost his job, and fled to Brazil and then to Israel. He had the sympathy of Einstein and Richard Feynman but remained one of the silent contributors to the theory. Even Einstein turned away from Bohm in 1952, calling his approach “too cheap”.